Stephan has more creativity in his pinky than most can muster in a lifetime, though you’d never hear it from him of course. Modest and entirely unpretentious, he is the backbone of Sandbox’s strategic creative department. A purposefully process-driven designer with an innate sense of curiosity, our clients know Stephan can be counted upon not only for inspired visual communications, but for connecting creative output to their organization’s ultimate objectives. Stephan’s applied problem-solving approach to visual challenges results in a uniquely thoughtful, steady and logical methodology to his creativity. Born and raised in Calgary, Stephan has always had a strong connection to what makes this corner of the world a vibrant and special place. Continuing to focus on the growth and well-being of the people and community to which he belongs, Stephan brought the worldwide lecture series CreativeMornings to life here in Calgary – a monthly event for creative minds to meet, listen, and discuss over coffee and breakfast. 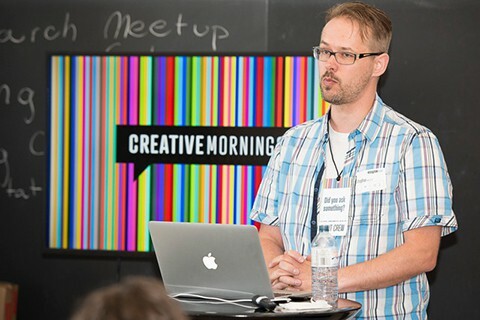 An alumni of Alberta College of Art and Design and with over 25 years of experience, Stephan has created designs for many local and national companies with projects ranging from packaging, retail point of sale materials and promotions, digital signage, corporate communications, advertising and brand strategy development. Stephan remains firmly grounded to his roots: grateful for the opportunities and support of his fellow Calgarians, he makes sure to give back to this wonderful place he calls home, building and promoting strong community and economic prosperity in Calgary. Being true to yourself in order to help others. By listening rather than talking. Being supportive, in whatever form that is. Being open and receptive to what people need and finding a way to help them get there.